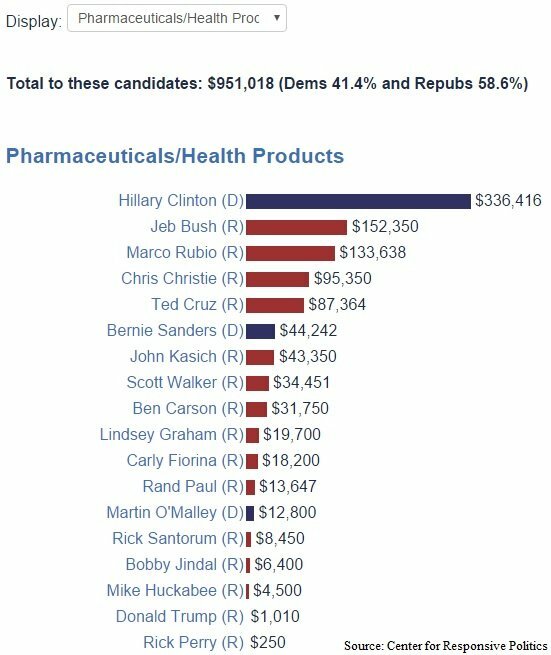 These big, bad companies continue to be big spenders, donating $951,018 to presidential candidates in the 2016 presidential election, according to the Center for Responsive Politics and the Federal Election Commission – including to her campaign.Clinton collected $336,416 in donations from the pharma/health industry, over a third of the total contributions during the 2016 presidential campaign. The next biggest recipient was Republican candidate Jeb Bush, who collected less than half the amount of Clinton. Trump received a whopping $1001 – enough to buy one Daraprim pill.